Enjoy a day on Mackinac Island and experience a historical treasure. Arriving by ferry boat, you’ll embark on a horse-drawn island tour with Mackinac Island Carriage Tours, visit the Wings of Mackinac Butterfly Conservatory, step back in time at historic Fort Mackinac and tour the Grand Hotel. 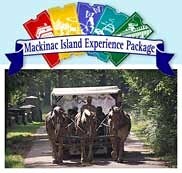 The Mackinac Experience Package includes round-trip ticket on the ferry of your choice, ticket for Mackinac Island carriage tours, admission to the Mackinac Butterfly Conservatory at Surrey Hill, admission to Fort Mackinac and admission to Grand Hotel before 5:00 p.m. Call the Mackinac Island Tourism Bureau 800-454-5227 for more information or visit the link for more.